When it comes to your bathroom, few things can provide a sleek, modern look like beautiful glass shower doors. If your bathroom in your Jacksonville, Florida, home has seen better days and you are looking for a way to restore it to its former glory, swapping out the shower curtain for a pair of stunning glass sliding doors is a surefire way to give your bathroom an instant facelift. The team at 31-W Insulation offers a number of different glass shower door styles, with customizable options, to help you breathe new life into your outdated bathroom. 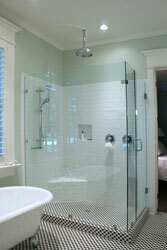 Glass shower doors will not only give your bathroom a fresh new look, but they will help your bathroom stay cleaner. Over time, shower curtains become stained or discolored, and without proper upkeep, they can become breeding grounds for mold and mildew. Not to mention, if they are left outside of the tub they can drip water onto the floor creating a dangerous slippery surface. There have also been concerns in recent years about shower curtains made with polyvinyl chloride (PVC) containing chemicals that can potentially be harmful to humans, especially young children. However, with new glass shower doors, you won’t have to worry about any of these issues – keeping your bathroom clean and tidy, and keeping your loved ones safe will be much easier. To learn more about the benefits of having glass shower doors installed in your home in Jacksonville, or to schedule a free initial consultation, contact 31-W Insulation today.